A transport helicopter of the Indian Air Force crashed after it hit an iron girder while trying to land at a helipad near the Kedarnath temple in Uttarakhand today. All passengers are safe and only faced minor injuries. A video has surfaced showing the chopper descending towards the helipad and crashing. Four people including the IAF pilot suffered injuries; they are out of danger, rescuers said. The helicopter was carrying eight people -- six passengers, the co-pilot and the pilot. The IAF's Russian-origin transport helicopter Mi-17 V5 caught fire after it collided with an iron girder. 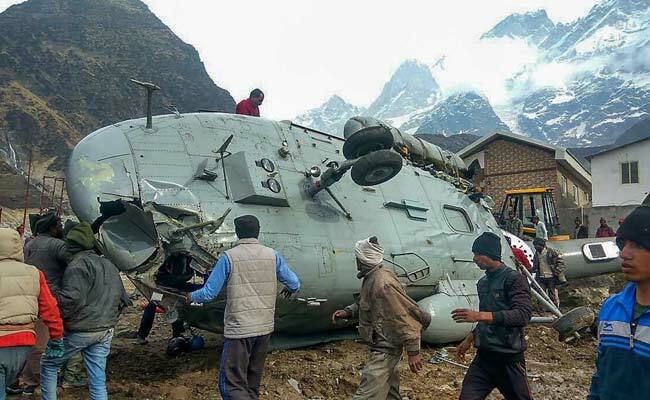 "Today morning one Mi-17 V5 helicopter of IAF crashed near Kedarnath (Uttarakhand)... A Court of Inquiry will ascertain the cause of the accident," the IAF said in a statement.